Two going on twenty. : Lucky. At lunch today I decided to poke my head in the thrift store next door to my office. It was just a quick walk through to see if there were any new coats/vintage clothes/handbags. I noticed a somewhat unremarkable bag that looks like it was circa 1940-something. I picked it up and opened it for no particular reason. Inside it had a teeny change purse. I opened that as well. 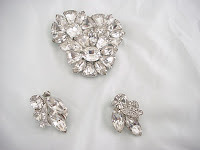 In there were two of the most beautiful silver and rhinestone vintage looking earrings. They were so shiny and new looking that I initially thought they were knock offs made to look vintage. The purse was obvz the real deal as far as being from the 1940's so I thought there was a slim chance they had just been sitting in that change purse since the 40's. I went to the counter and asked the guy what he would charge me for these earrings. I explained how I had come across them. He seemed interested in doing as little work as possible, so he said, "They are yours for 99 cents!" I figured that even if they were knock offs, they are REALLY pretty and you can't beat 99 cents! They have a marking on the back. I came back to the office and googled them. Turns out they are from 1941 Eisenberg ice collection. I found a pair on a website they are selling for $125. I don't think I will sell them because they are so pretty and in perfect condition. It makes me wonder if they really did just sit in that change purse for the last 66 years waiting to be found by me. Sweet score! It seems like old "items" tend to gravitate toward you, like the letter you found etc.